Let’s just get right to it. The last time USC won out in September was in Lane Kiffin’s first year (2010). 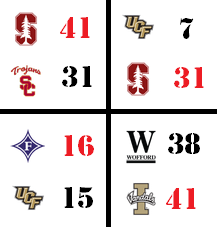 September losses have pretty much become a habit with the Stanford capping off a five year streak. Speaking of 2010, that’s what USC’s defense looked like. Stanford was completing passes all over the middle of the field and running it up the gut successfully. It was as if we had a 4-0-4 formation on defense since the linebackers were nowhere to be found! Just kidding, that’s mean. Outside linebacker Su’a Cravens made a lot of plays and was one of the redeeming factors on defense. How does USC’s defense allow more points than a Central Florida team that goes on to lose to Furman. The Furman Paladins are in the same FCS conference as the Wofford Terriers, which even Idaho could beat. Kevin Hogan had one of the best games of his career. Although his statistics are comparable to Kessler’s the stats don’t tell the entire story. I’d venture to say that if Kessler had the same amount of time in the pocket as Hogan, the USC offense would probably never have punted. With the time of possession slanted (angled?!) heavily in Stanford’s favor, it was hard to get on the field and score points. Stanford controlled the ball nearly twice as long as USC did. Who would’ve thought USC would get caught in a shootout with Stanford? No side produced any turnovers and both teams had nine meanginful possessions, so it came down to punting, turnovers on downs, and being held to field goals. So if we do the simple math, if USC had one less turnover on downs and punt, they would tie Stanford. Suppose one went for a touchdown and the other was held to a field goal. The score would’ve been tied. USC would routinely forced a third down situation and Stanford answered by converting an astouding 66.7% (8/12) of third downs. Had USC stopped them two more times, this game could’ve been extremely different. Alternatively, had the offense converted some more of their own third downs, the outcome would’ve been different as well. Going 4 of 10 on third downs isn’t pretty, but it’s hard to ask an offense to do much more than they did. Let’s be honest. Kessler’s stats are probably still Heisman worthy. In three games, he’s thrown 89 passes and completed 78.7% for 922 yards, 10 TD and 0 INT. He has also continued to improve on things he has been criticized for. For one, he took off and ran for the first down when the lane was there. That 18 yard run set up the touchdown to retake the lead. Unfortunately, his underthrown swing pass to Tre Madden earlier in that drive is what ultimately killed USC’s running game. After running successfully in the first half, Madden, fell awkwardly after making the catch. He would not run the ball again. After the running backs picked up 126 yards in the first half, they posted a measly 22 yards in the second half. What’s more concerning is that the offensive line couldn’t protect Kessler on numerous occasions. Their pass blocking remains one of many weak points for this team. The line also picked up half the teams penalties (4 for 45), all by the returning starters Chad Wheeler, Zach Banner, and Max Tuerk. Some of them like the personal foul were completely preventable. Those costly penalties quickly caused drives to stall out. That wasn’t the end of stupid penalties though. There was stupid stuff like an unnecessary holding that got Adoree’ Jackson’s kickoff return called back. To make matters worse, they tacked on an unsportsmanlike conduct penalty. What would’ve been a touchdown, quickly became starting within their own 10-yard line. Through the first two games, the Trojans picked up just nine penalties. Against Stanford, it came out to eight—and that’s not counting all the offset and declined penatlies. The defensive line could not create enough pressure with a standard 4-man rush. Furthermore, Hogan had a wide open left edge when he was flushed out of the pocket. Had Hogan not get rolled up under Anthony Sarao at the start of the second half, he may have exploited the lack of contain on the left edge many more times. Regardless, Hogan threw some of the best passes of his career and certainly the best he ever played against USC in three tries. On multiple deep passes he had perfect touch, making them pretty much indefensible once in the air. Needless to say, Sark needs to get together with Coach Connelly and Wilcox to work on some things. Only three teams haven’t turned the ball over this season: USC, LSU, and West Virginia. Both LSU and WVU have only played two games to USC’s three. No kickoffs out of bounds this week!!! Special teams win! Wide receivers have been blocking really well—better than they have been in years. They have turned some standard runs into big gains. On JuJu’s 54-yard catch and run, Darreus Rogers and Steven Mitchell Jr. threw key blocks. Misleading Stat of the Week: USC is last place in the Pac-12 standings.